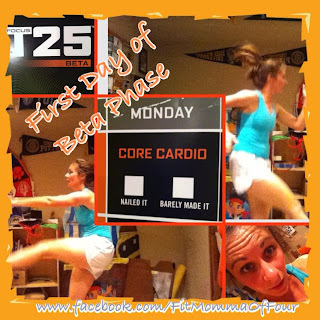 Fit Momma of Four: Focus T25 Beta begins! Well, it took me six weeks to get through the Alpha phase of Focus T25 instead of five (I re-did week 3) & I have finally started the Beta phase yesterday! Focus T25 is such a well-built workout. Shaun T has set it up so that you really build the foundation in Alpha before you move onto Beta. Yesterday I did Core Cardio - it had many familiar moves from Alpha Cardio, but kicked up a notch & a few new moves thrown in there. Today I did Speed 2.0 - once again, many familiar moves from Speed 1.0, but taken to the next level. No stretch "breaks" in this workout! I did find it hard to move my feet fast enough at some points, so I would take a few steps with the modifier, Tania, and then get back to full-force with Shaun T & the rest of the crew.